In Qatar we have a serious issue with cat over-population, it causes all sorts of problems because a lot of people aren’t cat lovers to start with, plus when the cats aren’t fixed (neutered/spayed) the behaviour associated with mating (yowling and fighting) does not help their case, or indeed the continual flow of offspring. Unfortunately this often results in residents complaining about the cats and asking for them to be removed, or taking things into their own hands, neither bodes well for the cats – who after all, didn’t ask to be born into such harsh circumstances! On the gated compound where I live we do have our fair share of street cats, some people love them, some hate them and want them gone. However, there is a solution to keeping the amount of cats under control, addressing the concerns of residents and also protecting the cats. Trap/Neuter/Return, commonly referred to as “TNR,” is the only method proven to be humane and effective at controlling the feral cat population. Using this technique all the feral cats in a colony are trapped, neutered/spayed and then returned to their territory. * No more nuisance behaviour – studies show TNR improves relationships with human neighbours. TNR puts an end to the behaviours associated with mating (howling and fighting), that are often cited as concerns by residents. One study found that after Trap-Neuter-Return was implemented, the calls of complaint from residents about cats significantly decreased. * The population stabilizes—no new kittens! Once TNR is in place, the cats will no longer reproduce, the population will stabilize. * No issues with rats and mice – cats are predatory animals and help keep the mouse and rat population down! Even the scent of a cat deters rats; we would be overrun with rats if it wasn’t for the cats. TNR is the solution we need on my compound. I have done TNR extensively in various countries and a group of people on my compound have already started fixing the cats and are dedicated to making this work. The only thing holding us back is raising enough funds to cover the vets bills; it costs at least USD 96 to spay a cat! I am donating 20% from the sale of each Original Artwork to help fund a spay or neuter, it is nowhere near enough money but at least it is a start. We want to show the compound management and the residents, that there is a humane solution that allows the cats and the residents to live peacefully together. Our compound cats are fed by volunteers and carefully monitored by their carers to ensure they stay healthy but they are sadly under threat because their numbers are growing too rapidly, so we have to move fast and get them all fixed! After over 20 years living abroad, I am finally returning to live in my home town of Dorset. A lot of my time overseas has been spent in the Middle East - Bahrain, Abu Dhabi, Dubai and now Kuwait. 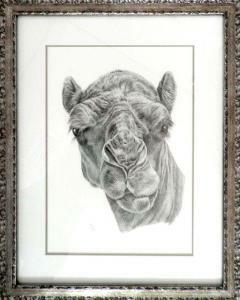 It seems somehow fitting, that my final commissioned drawing done on Kuwait "sand", is that of a camel! This camel I photographed in Ras Al Khaimah; there is a camel racing track there which we visited one afternoon. There wasn't an actually race happening at the time but there were young camels practicing on the track and groups of camels meandering around outside the track. This guy we met wandering around, he actually came over, lowered his nose for a stroke and cooperated nicely by posing for photographs. 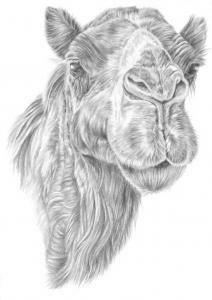 I have loved drawing these amazing creatures so much, I hope at least someone in the UK would like a camel drawing! So the pencils are being packed away, to be revisited on UK soil. Farewell to expat life, hello green trees, countryside and finally putting down some roots. This is a new piece that I have been working on for a few weeks. All the basics are now in place, onto my favourite part which is adding the detail and trying to get it to "pop"! I love this breed of dog, unfortunately so do also a lot of people in the Middle East; which is where I am living at the moment. These poor dogs are not suited to a desert climate, so I feel sorry whenever I see one here, bet they wish they were in the snow in Canada! Teddy belongs to a friend of mine and I did this portrait as a surprise leaving present for her; she had been living in Kuwait and was moving back to good old Blighty. Teddy had a sad story to tell, he had been passed from owner to owner because he had a very upset stomach brought on by allergies. When my friend adopted him, he was a very sick boy and pretty much scared of everything. Luckily for him, this time he had been adopted by the right person! He was tested to find out what exactly he was allergic to and then began the slow process of managing his allergies, plus building his trust in people. He is now the most contented cat, allergies under control and extremely loved - so nice to have a happy ending. At the moment we are living in Kuwait, where there are sadly never ending problems with stray animals, dumped animals and cruelty cases. It is very sad and makes you feel so helpless in the face of the enormity of the situation, it will unfortunately though be a very longtime before any real improvements are seen. I could write pages on this subject alone but the aim of this post is to tell the tale of two tiny Arabian Mau's my husband rescued, whilst my daughter and I were on holiday in the UK. On his morning jog he found a tiny tabby kitten in the middle of the road, literally pulling himself along (he was so young, he couldn't even walk properly yet). My husband did the right thing (I trained him well), he found the kittens litter mate in a nearby bush, and placed the tabby back, in the hope that mum would return; a lot of people don't realise that the females leave their kittens whilst they go out searching for food, they only return to feed them. Often people pick up what they think are abandoned kittens but if they are in quite good shape, mum probably just left them for a while. Anyway, unfortunately in this case, mum didn't return; in Kuwait the way they control the animal population is by poisoning, so mum might have gone that unfortunate route, or else could have got run over, but the main point was, she wasn't coming back. Well the new babies are now about 7 weeks and slowly gaining strength.They have had their first trip to the vet for vaccinations, something they didn't enjoy at all, well who can blame them really! 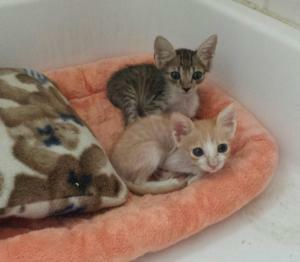 Now we have the massive challenge of finding them a forever home. Unfortunately there is a complete lack of good homes for animals in Kuwait, we might even have to ship them to the UK or the USA in the search for the perfect home for them, a very expensive option. In the meantime, they are growing steadily, even though they now look quite big in the latest photos, they are still only tiny babies and weigh about 1 pound each! I hope the perfect home is out there for them, the search is now on! This adorable little monkey I photographed in Baguio in the Philippines. Unfortunately he was being kept as a pet and was on a long chain tied to the post that he is clinging to. At the time, Baguio was hosting a garden show/competition and somebody seemed to think he enhanced the look of their garden � as I expect you can tell, I am totally against keeping wild animals as pets! In any case, even though this photograph doesn't hold good memories for me, I do love the depth of emotion in his eyes. I always strife to show emotion in my drawings, therefore I wanted to attempt this one. My husband in the background is saying � A frightened monkey, Denise no one will buy it�! 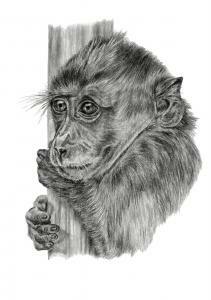 However instead of being commercial, it is more important for me to draw what moves me, so a worried monkey it is! Here he is, the finished little monkey. I am so sorry I couldn't help him escape the situation he was in. The original actually did sell, husbands don't always know best! However he is also available as a print. Unfortunately it is an all too common sight to see animals suffering on the streets of Kuwait. Non-existent animal welfare laws, coupled with abuse and complete lack of understanding for animals, is very hard to witness. All too often an unwanted pet is dumped on the streets, very sad to see animals viewed as disposable. KARE (Kuwait Adoption & Rehabilitation Education) aims to help abused animals find their way back into domestic life with loving, caring families. 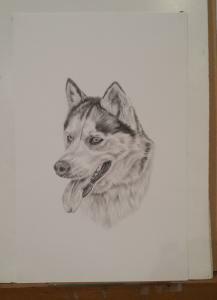 In a bid to raise funds to help KARE cover their veterinarian costs, a selection of artwork is available for purchase at Royal Animal Hospital , 50% from any sales will be donated to KARE. Hopefully we can at least help some of these so very deserving animals. Myself and a group of ladies would meet once a week round Christine�s apartment and she would teach us the wonders of pastel. Christine was such an enthusiastic teacher, we all got completely addicted, we even progressed to doing art shows together. So this little pastel kitten, came from all the techniques Christine taught me during my stay in Abu Dhabi. Having since then immersed myself in graphite work, I hadn�t touched a pastel for years, had even given away my pastel set to a friends daughter who was showing an interest. Suddenly though I had an urge to create in colour, and went out and bought a pastel set. It was so enjoyable to see this cat take shape and in comparison to my pencil work, so much quicker. The pastels have now gone away for the time being, but I am sure it won�t be too long before they come out again. In Kuwait the predominate way of controlling the over population of streets cats is to poison them, shocking in this day and age considering the well documented alternatives. TNR (Trap/Neuter/Return) is the humane and effective approach for stray and feral cats. Using this technique feral cats are trapped, neutered and then returned to their territory. Grounded in science, TNR stops the breeding cycle of cats and therefore improves their lives while preventing reproduction. It is a fact that the removal and killing of outdoor cats is never-ending and futile. TNR provides a life-saving, effective solution for these beautiful, independent cats. Every cat that is fixed does make a difference - one cat and her offspring can produce 420,000 kittens in 7 years! Unfortunately it is an all too common sight to see cats suffering on the streets of Kuwait. The harshness of the climate, coupled with the abuse and complete lack of understanding for animals, is very hard to witness. In a bid to raise funds to cover veterinarian costs, a selection of prints are available for purchase at Royal Animal Hospital . 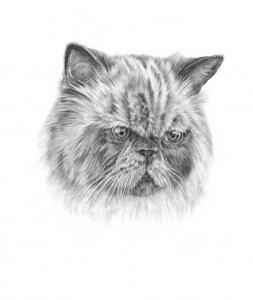 100% from any print sales will be donated and placed in an account at the the Royal Animal Hospital, the funds are then used to treat sick or injured cats and for TNR. Hopefully we can at least help some of these so very deserving cats. Very happy, Noble One won 3rd prize in the Black and White competition.